I’ll be honest. When I came across this old newspaper clipping, I hoped it would make for a fun story after Canada won another gold medal at the World Junior Championships … or had at least qualified for the medal round! But really, the strong showings this year by Finland, Russia, the U.S. and Sweden just goes to show how right this story was. That’s certainly true, and the use of the word Dominion in the clip I found is a pretty good indication that the writer wasn’t Sidney Crosby or Wayne Gretzky or even Phil Esposito. So, who was it? 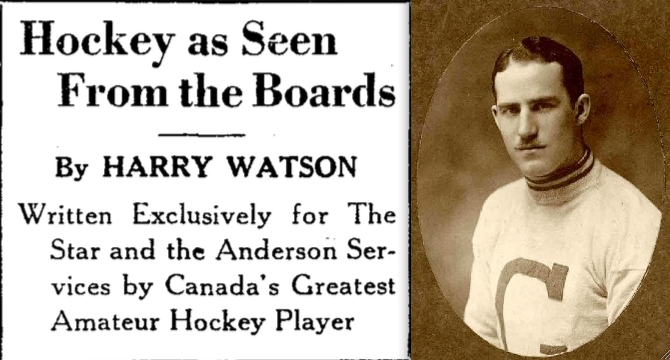 It was the star who’d led Canada on a romp to the gold medal with the Toronto Granites at the first Winter Olympic Games in 1924: Harry Watson. He wrote his thoughts in the Toronto Star on December 28, 1929. “Canada will always be recognized as the home of hockey and will continue to contribute more players to the game than any other country,” Watson continued, “but already some of the United States colleges are producing players of the first rank and increased interest in hockey on the other side [of the border] will help to bring them on more and more. 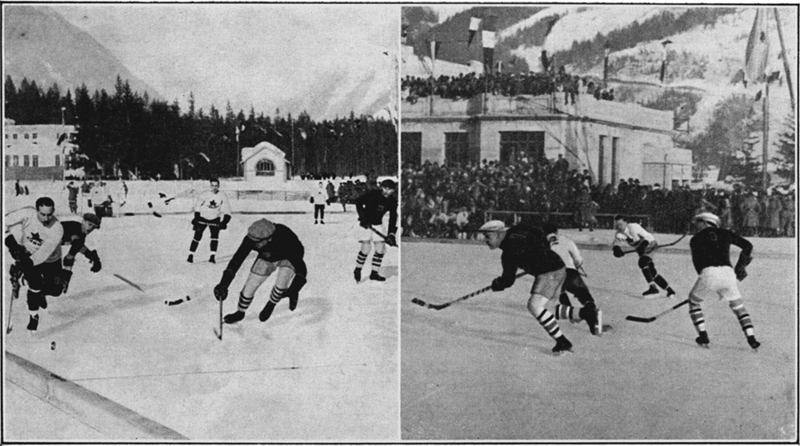 Two shots of Canada in action against the United States while en route to a 6-1 victory in the gold medal game at Chamonix, France in 1924. Canada had previously run up scores of 30-0 versus the Czechs, 22-0 vs Sweden, 33-0 vs Switzerland and 19-2 over Great Britain. Harry Watson (seen at the far left) scored 37 goals in those five games. Interestingly, Watson had nothing to say about Sweden or Finland. But in 1929, Finland had yet to appear at a major world tournament and hockey fans would already have been aware of the Swedes. “They were without a doubt the best of the European teams,” Frank Fredrickson of the Winnipeg Falcons said after leading Canada to gold at the 1920 Olympic tournament (which was held in the spring, in conjunction with the Summer Games in Antwerp, Belgium), and Sweden had recently won a silver medal at the 1928 Winter Olympics. Of course, no one was talking about the Russians as a hockey power in 1929. The sport didn’t really get started in the Soviet Union until the early 1930s, and didn’t take off until the end of World War II. In 1948, the LTC Prague team from Czechoslavakia came to Russia and could manage no better than a 1-1-1 record in three games with the Moscow Selects. This was big news behind the Iron Curtain, but little notice was taken of it here in the West. By April of 1951, the growing success of the Russian national team against other Communist countries was harder to ignore. The articles that follow all contain the same story, but the different headlines seem to indicate that few in North America took it very seriously. the Decatur Herald, the Terre Haute Star and The Pantograph (Bloomington, Illinois). My friend and colleague Igor Kuperman had some information for me about this game. The Soviets were coached by the soon-to-be legendary Anatoli Tarasov and the team had gone to Berlin to practice on artificial ice and play games against the East Germans. It would be another three years before the Soviets finally entered the World Championships, but they won the tournament at their 1954 debut, and added an Olympic gold medal in 1956. By the 1960s, Canada could no longer expect to dominate international hockey tournaments merely by showing up. Canadians still expect gold from their hockey teams – and often get it – but you can’t win ’em all. Very interesting this hockey history….I have NO idea about Canada playing all those teams…WOW!! We as a country have played hockey forever!!!!! LOL….